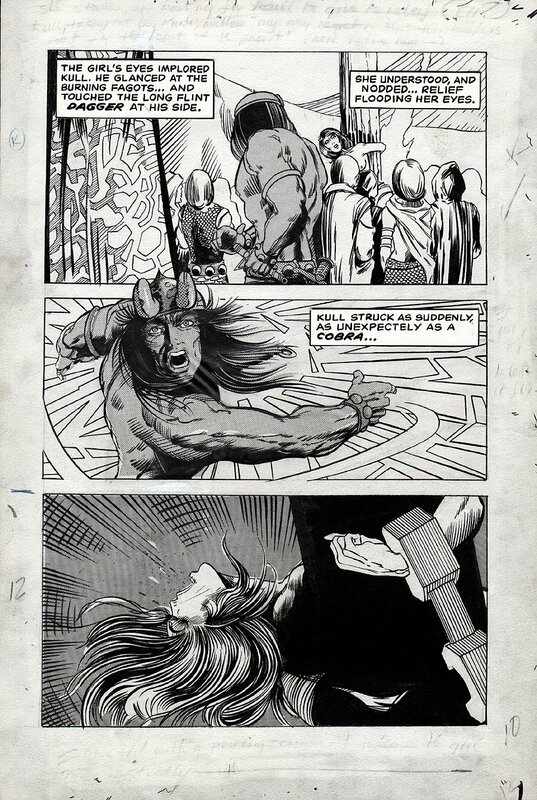 Offered here is a STUNNING page from the historic prototype for Conan The Barbarian entitled "Kull of Atlantis" that Barry Smith created in the months before he drew Conan the Barbarian #1 in 1970. This is pure Smith art, both pencils and inks, with a technique Barry Smith used as a shading method for this page called screentone (brand name, Zip-A-Tone). Art features only large, powerful panels of exceptional quality. Because it was developed with a paperback format in mind, the pages were drawn slightly smaller on 9.25 by 13.75 inch art board with 7.5 by 11.5 inch drawn image area. Smith adapted the look he developed for Kull here into his now legendary design for Conan The Barbarian. Kull was created by Robert E. Howard and introduced in the Weird Tales pulp in 1929 three years before Howard introduced Conan in Weird Talesin 1932. Kull would also appear in Marvel Comics starting in Conan the Barbarian #1 and later have his own title. In the late 1960s, Marvel's Roy Thomas proposed licensing the Conan character for a comic book adaptation. The first Marvel title, Conan the Barbarian began in 1970 and is well-known in comic book history. In order to keep the comic book profitable despite the licensing fee, Marvel assigned its newest, and lowest paid artist, a young Barry Smith, who previously had been working as a fill-in artist for the publisher. While the licensing deal with the Howard estate was in the works, Thomas and Smith also came up with the idea of taking on a different Howard character, Kull, and reaching out to a paperback publisher with a different format that combined Smith's illustrations and Howard's original text. Since paperback pages were smaller than comic book pages, Smith created 18 glorious two and three-panel pages, and a splash page, for the initial story, entitled "Kull of Atlantis." A second splash was later created, likely intended as a cover image. Marvel reached an agreement on Conan, and Barry Smith ended up using his Kull design for Conan instead. Barry Smith's legendary run on Conan the Barbarian starting in 1970 is one of the best combinations of creator and character in the history of the medium. Created by author Robert E. Howard, Conan had been around in pulps and paperbacks for 5 decades when Marvel began to adapt the character in comic books and the timing could not be more perfect. Writer Roy Thomas and young Barry Smith teamed up for a few glorious years and they created a magical run that brought the Sword and Sorcery genre to life in comic book form. In essence, this artwork RIGHT HERE is the birth of this genre. Barry Smith's popularity grew tremendously over the course of his Conan run, and is he's now known as one of the finest fantasy artists in the history of the medium. The artist's technical brilliance depicting Conan and the world he inhabited, not only introduced a new generation to the hero, but would also make Conan the Barbarian one of the most influential comic book titles in the history of the medium. An abbreviated version of 8 pages from the 20 page story this page is from "Kull of Atlantis" finally saw print in 1974 in Savage Sword of Conan #3. It was also reprinted again in Conan Saga #51 (1991). ALL art on our website (including this one) are able to be purchased with VERY fair time payments, and trades are always considered towards "ANY" art on our website! Just send us an email to mikeburkey@aol.com and we can try to work something out.